Map, "To His Excellency William Tryon Esqr. Captain General & Governor in Chief of the Province of New York & This Map of the Country of the VI Nations Proper, with Part of the Adjacent Colonies is humbly inscribed by his Excellency's Most obedient humble servant Guy Johnson 1771", 12-1/2” x 8-1/2”, engraved by J. E. Gavet, Albany c1850. The key includes markings for “Indian Villages, Chief Towns or Large Villages, Indian Paths, and The Boundary Settled with the Indians in 1768 as described by a dotted Line.” Further explanation of the map, "By the Country of the six Nations proper is meant that part within which they principally reside, the rest which is of Vast extent being chiefly occupied by their dependants. 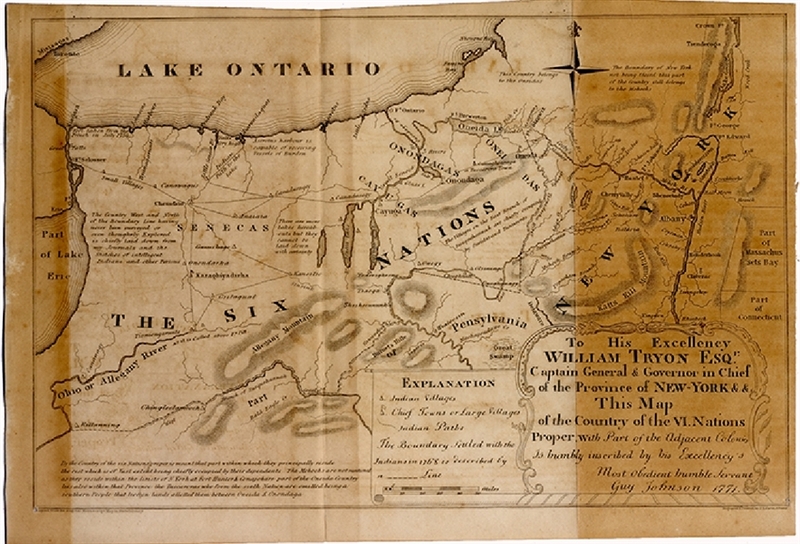 The Mohocks are not mentioned as they reside within the limits of N. York at Fort Hunter & Conajohare part of the Oneida Country lies also within that Province the Tuscaroras who form the sixth Nation are omitted it being a southern People that live on lands allotted them between Oneida & Onondaga." And another note,"The Country West and North of the Boundary Line having never been surveyed or even thoroughly Explored is chiefly laid down from my Journals and the Sketches of intelligent Indians and other Persons." The map covers the region from Toronto on the northwest to Crown Point and Ticonderoga on the northeast, to Kittanning on the southwest to Rhinebeck, New York on the southeast. Lake Ontario and Part of Lake Erie are shown. Tribes include Onondagas, Cauygas, Senecas, Oneidas, the Mohocks. Some tanning, else VG. The six nations, also known as, The Iroquois Confederacy, is believed to have been founded by the Peacemaker in 1142, bringing together five distinct nations in the southern Great Lakes area into "The Great League of Peace". Each nation within this Iroquoian confederacy had a distinct language, territory, and function in the League. Iroquois influence at the peak of its power extended into present-day Canada, westward along the Great Lakes and down both sides of the Allegheny mountains into present-day Virginia and Kentucky and into the Ohio Valley.